An aviation instructor also helps a student acquire skill knowledge, which is knowledge reflected in motor or manual skills and in cognitive or mental skills, that manifests itself in the doing of something. Thus, skill knowledge differs from declarative knowledge because the student is not usually aware of it consciously or able to articulate the skill. Evidence of skill knowledge is gained through observations of performance. This knowledge of how to do things is based on extensive practice, which leads to the storage of skill knowledge. An everyday example of skill knowledge is the ability to ride a bicycle. Skill knowledge is acquired slowly through related experience. For example, a maintenance student who is learning to weld typically burns or cracks the metal being welded while an expert welder’s work is free of such imperfections. What does the experienced welder “know” that the beginner does not? The expert welder has had many hours of practice and a knowing-is-in-the-doing ability the inexperienced welder lacks. It isn’t always possible to reduce to mere words that which one knows or knows how to do. Students make their way from beginner to expert via three stages of skill knowledge acquisition, helping students transition from beginner to expert. The development of any skill acquisition (or the learning process) has three characteristic stages: cognitive, associative, and automaticity. An instructor must learn to recognize each stage in student performance in order to assess student progress. Cognitive learning has a basis in factual knowledge. Since the student has no prior knowledge of flying, the instructor first introduces him or her to a basic skill. The student then memorizes the steps required to perform the skill. As the student carries out these memorized steps, he or she is often unaware of progress, or may fixate on one aspect of performance. Performing the skill at this stage typically requires all the student’s attention; distractions introduced by an instructor often cause performance to deteriorate or stop. The best way to prepare the student to perform a task is to provide a clear, step-by-step example. Having a model to follow permits students to get a clear picture of each step in the sequence so they understand what is required and how to do it. In flight or maintenance training, the instructor provides the demonstration, emphasizing the steps and techniques. During classroom instruction, an outside expert may be used, either in person or in a video presentation. In any case, students need to have a clear impression of what they are to do. For example, Beverly enters a steep turn after increasing power by a prescribed amount and adjusting the pitch trim. She fixates on the attitude indicator as she attempts to achieve the desired bank angle. The bank angle exceeds tolerances as she struggles to correct it, making many abrupt control inputs. Even demonstrating how to do something does not result in the student learning the skill. Practice is necessary in order for the student to learn how to coordinate muscles with visual and tactile senses. Learning to perform various aircraft maintenance skills or flight maneuvers requires practice. Another benefit of practice is that as the student gains proficiency in a skill, verbal instructions become more meaningful. A long, detailed explanation is confusing before the student begins performing, whereas specific comments are more meaningful and useful after the skill has been partially mastered. As the storage of a skill via practice continues, the student learns to associate individual steps in performance with likely outcomes. The student no longer performs a series of memorized steps, but is able to assess his or her progress along the way and make adjustments in performance. Performing the skill still requires deliberate attention, but the student is better able to deal with distractions. For example, Beverly enters the steep turn and again struggles to achieve the desired bank angle. Still working on the bank angle, she remembers the persistent altitude control problem and glances at the altimeter. Noticing that the aircraft has descended almost 100 feet, she increases back pressure on the control and adjusts the trim slightly. She goes back to a continuing struggle with the bank angle, keeping it under control with some effort, and completes the turn 80 feet higher than started. Automaticity is one of the by-products of practice. As procedures become automatic, less attention is required to carry them out, so it is possible to do other things simultaneously, or at least do other things more comfortably. By this stage, student performance of the skill is rapid and smooth. The student devotes much less deliberate attention to performance, and may be able to carry on a conversation or perform other tasks while performing the skill. The student makes far fewer adjustments during his or her performance and these adjustments tend to be small. The student may no longer be able to remember the individual steps in the procedure, or explain how to perform the skill. In learning some simple skills, students can discover their own errors quite easily. In other cases, such as learning complex aircraft maintenance skills, flight maneuvers, or flight crew duties, mistakes are not always apparent. A student may know that something is wrong, but not know how to correct it. In any case, the instructor provides a helpful and often critical function in making certain that the students are aware of their progress. It is perhaps as important for students to know when they are right as when they are wrong. They should be told as soon after the performance as possible, and should not be allowed to practice mistakes. It is more difficult to unlearn a mistake, and then learn the skill correctly, than to learn correctly in the first place. One way to make students aware of their progress is to repeat a demonstration or example and to show them the standards their performance must ultimately meet. Theories about how a skill evolves from the awkward and deliberate performance associated with the cognitive stage to the smooth and steady-handed performance of the automatic response stage have one thing in common: progress appears to depend on repeated practice. Making progress toward automating a skill seems to be largely a matter of performing the skill over and over again. In skill learning, the first trials are slow and coordination is lacking. Mistakes are frequent, but each trial provides clues for improvement in subsequent trials. The student modifies different aspects of the skill such as how to hold the yoke or weld correctly. How long does it take to become proficient at a skill? Studies of skill learning have demonstrated that progress tends to follow what is known as a power law of practice. This law simply states that the speed of performance of a task improves as a power of the number of times that the task is performed. The logarithm of the reaction time for a particular task decreases linearly with the logarithm of the number of practice trials taken. Qualitatively, the law simply says that practice improves performance. 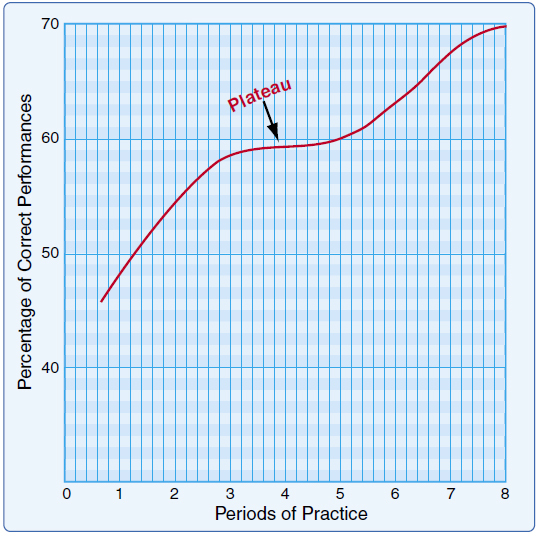 The graph in Figure 2-17 shows how the power law of practice relates the time required to perform a skill to the number of times the skill has been practiced. While it is impossible to predict how many practice trials a student will require to develop a skill to maturity, the general shape of the power law of practice offers some clues. Learning progress proceeds at a fast pace in the beginning (when there is ample room for improvement) and tends to slow down as performance becomes more skilled. In later stages of learning, improvement is more gradual. Once the curve levels off, it may stay level for a significant period of time. Further improvement may even seem unlikely. This is called a learning plateau. Figure 2-17. Students will probably experience a learning plateau at some point in their training. Learning plateaus are a normal part of the learning process and tend to be temporary, but instructors and students should be prepared for them. A learning plateau may signify any number of conditions. For example, the student may have reached capability limits, may be consolidating levels of skill, interest may have waned, or the student may need a more efficient method for increasing progress. Instructors themselves can bring on a learning plateau by overpractice. After repeating any task three or four times, give it a break to avoid causing a learning plateau. Keep in mind that the apparent lack of increasing proficiency does not necessarily mean that learning has ceased. The point is that, in learning motor skills, a leveling off process, or plateau, is normal and should be expected after an initial period of rapid improvement. The instructor should prepare the student for this situation to avert discouragement. If the student is aware of this learning plateau, frustration may be minimized. Instructors can help students who fall into a learning plateau by moving the student to a different place in the curriculum and giving the current task a break. Instructors should also be aware that they can bring on a learning plateau by over-practice. Learning plateau problems can sometimes be alleviated also by the instructor better explaining the lesson, the reason for the lesson, and how it applies to the student.